Casual weddings have become more and more popular among low-key couples who appreciate simplicity and elegance. 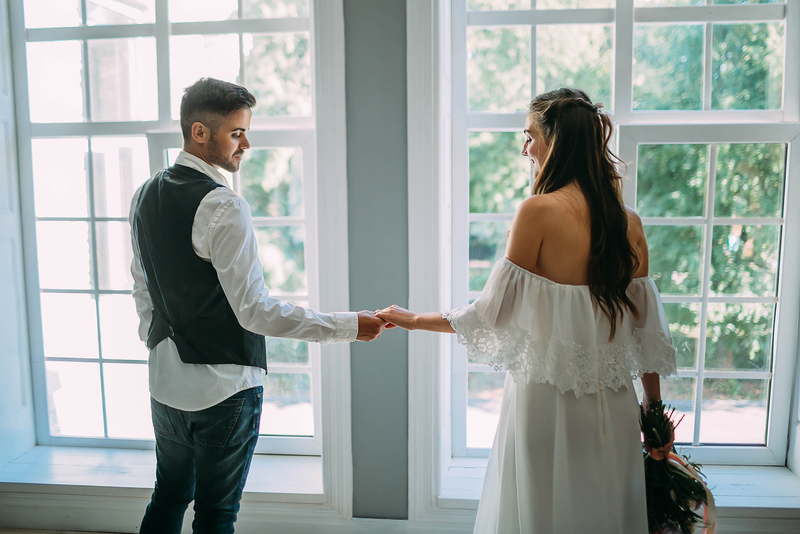 Even when keeping the balance between an unconventional approach and fun, it’s possible to create a stylish ceremony and make this special day in your life memorable. If a pompous celebration is not your cup of tea, give your preference to a casual wedding. We are going to share with you some advice to inspire you and push the limits of your creativity. Here we go! Informal brides have complete freedom of choice regarding casual wedding dresses. You can prefer knee-length, long, high neck halter dresses with short or ¾ bell sleeves depending on personal taste. Cocktail or embroidered dresses will create flirty silhouettes and draw attention to your personal perfection. Bright corduroys with suspenders, a pair of oxfords, a blazer and a neat shirt complemented with a waistcoat and a bright tie would be the best option for grooms. If you’re going to have an informal ceremony, don’t be afraid to wear denim with suit jackets and cowboy boots. 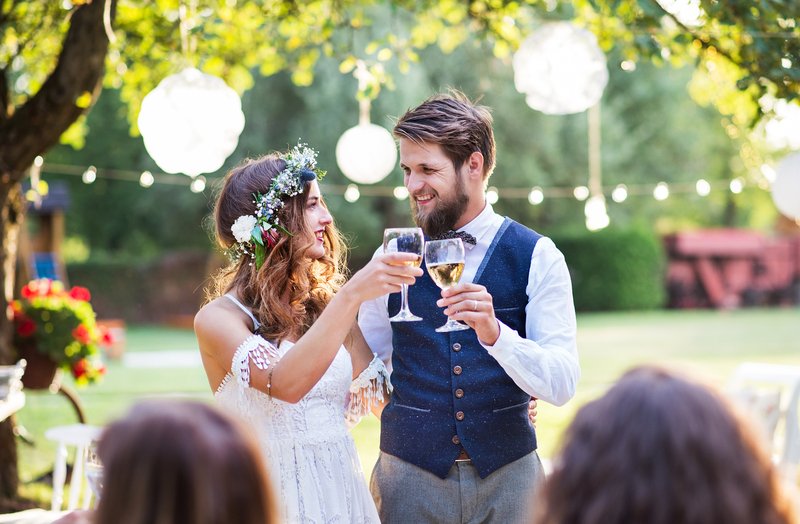 When choosing a place for your wedding celebration, a relaxed vibe is your main goal. Your guests must feel like they’re at home, restrained and unstressed. You should first pay attention to venues and locations that aren’t considered appropriate places for traditional weddings. A café where you had your first date, your parents’ backyard or even the local museum may be suitable. Why not? You have a great variety of options. And remember, you don’t need a huge amount of décor to create the greatest day in the history of your life. No wedding is complete without music. 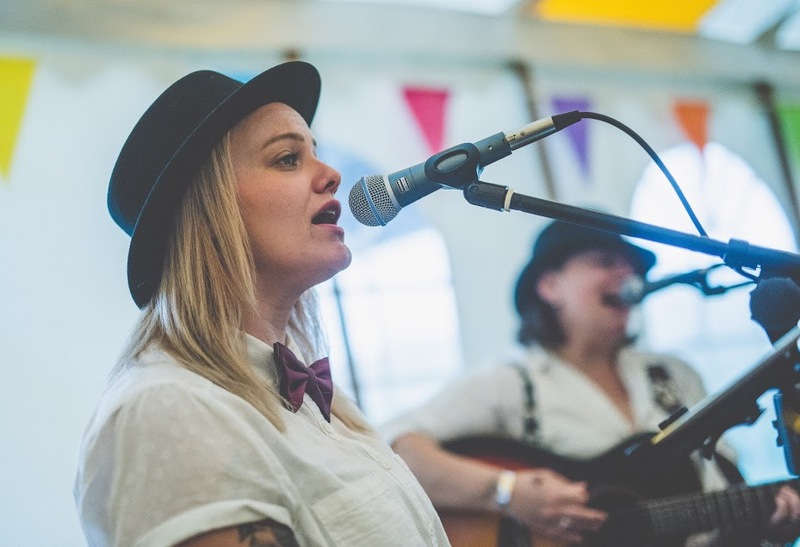 Acoustic wedding bands are a great way to bring that chilled out, relaxed vibe to your day. Consider this type of wedding entertainment as a perfect non-intrusive option. 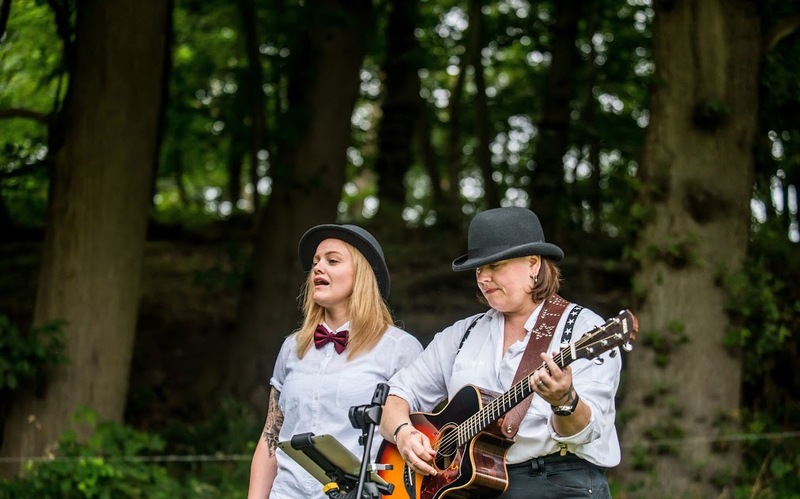 Solo and duo acoustic singers are also seamless in the way that they can integrate themselves into your party and provide background tunes. 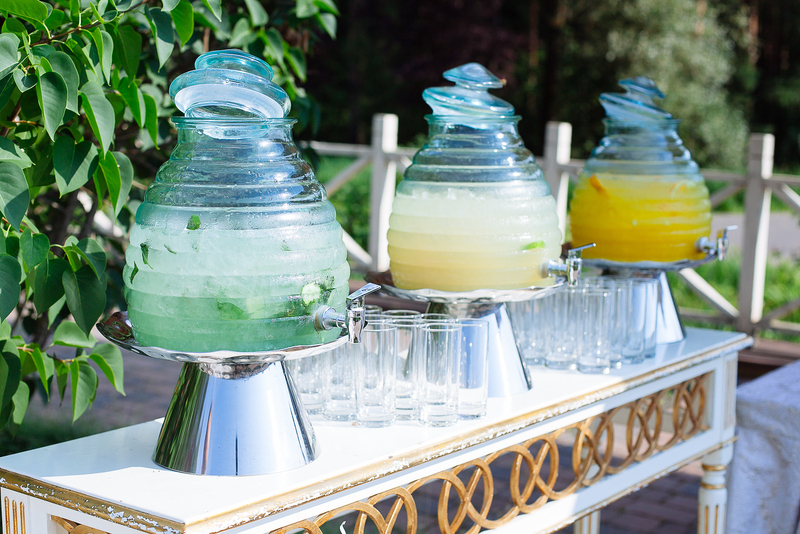 Offer your guests simple cocktails, non-alcoholic drinks or champagne as soon as they arrive. Water, tea stations or a set of cold drinks would be a good idea too. Choose an accessible place for them to provide your guests with a possibility to enjoy refreshments on their way to seats. 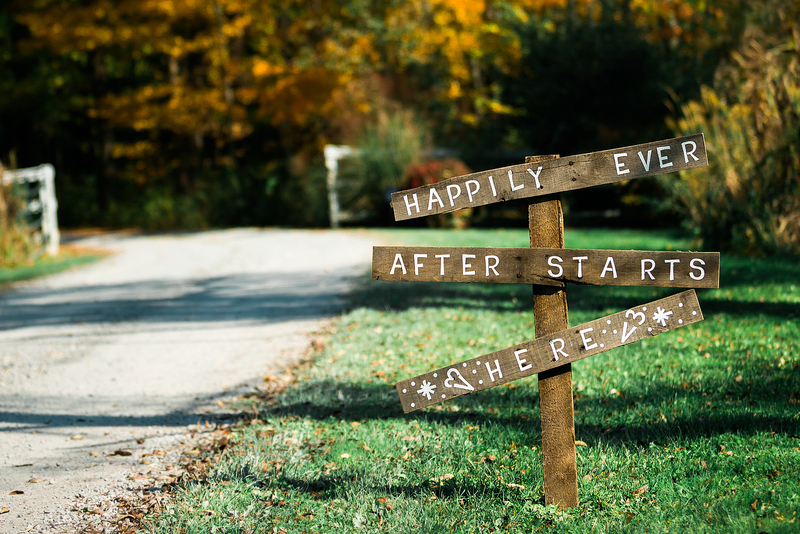 Type of seating depends on the location where you’re going to have your ceremony. If you marry in the park or backyard, lay some bright blankets on the grass in a way like you do for a picnic. If the ceremony takes place indoors, gather all your chairs, armchairs and sofas in one room. Keep in mind that elder guests would need some supportive options. You don’t need over-the-top floral decoration, but a fresh, natural atmosphere is always welcomed! Blooming flowers and greenery will help to create a festive atmosphere, full of life and harmony. Imagine how beautiful you will look on photos standing among amazing rosemary garlands or olive leaves. You could also use eucalyptus or some tropical plants for this purpose. Decorate your ceremony backdrop with different greenery, use bouquets to add a variety of shades to make the atmosphere more festive. Choose different textures for backdrops and centerpieces to create an impression of the place drowned in endless green. Creative signage will brighten up your decor without showing-off and undesirable vanity. You can write some words of greetings or a favourite quote. There are many options to make it stylish and attractive. Print words on a canvas banner or write them on the wooden tablet. Neon illumination will make letters more bright and visible in the intimate darkness. It’s really hard to imagine casual weddings without informal dinner. And anything can’t be better than a fresh, tasty pizza with a beer. Order a food truck to avoid any hustle and bustle. It’s the best way to provide your guests with a delicious-smelling piece of margarita in the location where the in-house caterer is absent. Be sure most people will be happy with a slice of pizza, so there’s no need to spend money on fancy treats. Visit Warble Entertainment for more wedding entertainment ideas and themes for your big day.